The anticipated VetShopAustralia.com.au Surfing Dog Spectacular took place over the weekend and proved to be the highlight of the Noosa Festival of Surfing opening ceremony giving former pros and surf legends a run for their money in the popularity stakes. 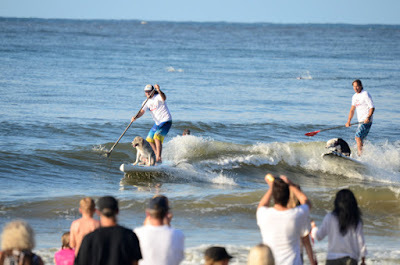 Crowds swarmed as the surf dogs lined up and prepared to show their doggy surfing skills to the world. The four-legged contestants did not disappoint, with an exciting display of surfing given by each one of the furry surfers. Chris De Aboitiz and surf dog Lani stole the show as expected, however it was the style of Rama, an 11 month old kelpie cross which caught the eye of Former Olympic Gold medalist and Bayer event ambassador Giaan Rooney, awarding the pup with a silver dog bowl trophy for his efforts. Special mentions were also given to Border collie Murf who scored some of the longest rides in the event and to Cleo the staffy, who kept her paws on the nose, getting some loud cheers from the audience. VetShopAustralia.com.au Managing Director, Mark Perissinotto said he was overwhelmed with the audience’s response of the event and is excited to watch the surfing dog craze grow. “The event was an Australian first, which means we really didn’t know how the public would react. Judging from the massive crowd and positive feedback on the day, it seems our hunch was correct and everybody loves surfing dogs!" Surf festival organisers were also thrilled with the hype surrounding the VetShopAustralia.com.au Surfing Spectacular announcing there was no need for pro surfers to bring in the crowd-Just dogs! Check out event photos on our VetShopAustralia.com.au Facebook Page. Stay tuned for our exciting Surfing Dog Video soon to be released! THis was so much fun. Thank you vetshop for organising what was a great day!